Home » Golf Tips & Instruction » FAQ » History Of Golf Tees: Who Invented Golf Tees And How? ​In the earliest forms of golf, there wasn’t a designated tee box. Golfers would tee from within one club length of the previous hole. This was later extended to two and then four club lengths. Golfers would create a small mound of sand and tee the golf ball over it. Can you imagine the effort? Also, the people of the yore must have had a lot more patience. The trailing group didn’t just wait around for the leading group to putt, they also waited while these guys built mounds and tee’d off. Some of them would squirrel out sand from the holes for the mound. This often damaged the holes extensively. So much so, the clubs had to erect signs asking golfers not to dig up the holes. It is possible that the word ‘Tee’ originated from the Scottish Gaelic word ‘Tuitje’ pronounced Tytee. Tuitje refers to the conical shape of the Sand Tee. The Tuitje was inconvenient to the course managers and the players who had to clean their hands after every tee-off. Some courses provided specialized sand boxes where golfers could scoop sand from. Such sand boxes are still nostalgic fixtures of many old courses. Like many golf firsts, Old Tom Morris was responsible for creating separate tee boxes for the teeing. These areas were designated between eight and twelve club-lengths from the previous hole. 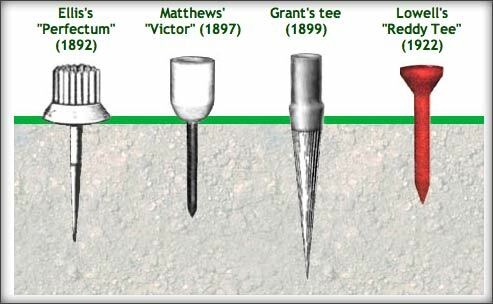 The first tee that penetrated the ground can be traced back to the Perfectum tee by Percy Ellis(1892). This looked like an upturned rubber bottle cap mounted on a metal spike. Then came the Victor Tee that looked like a wine glass with a long stem and no base. The ‘cup’ was made of rubber. PM Mathews from Scotland claimed a patent for this tee. ​The tee that finally put commercial tees on the map was the Reddy Tee(1922) designed by William Lowell. This looks a lot like the modern tee. These were probably called Reddy because of their red tops which made them more visible on the course. Soon enough Nieblo Manufacturing Company created and patented Reddy Tees made of white celluloid.